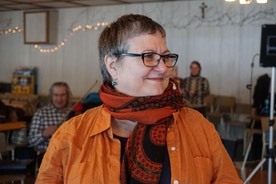 France Bourque-Moreau lives in Montreal, Quebec and for the past thirty-five years has been active in Canada and abroad teaching folk dances for children and conducting special seminars to train school teachers in this field. Her current repertoire includes hundreds of dances and rounds from all parts of the world especially designed and adapted to various age and experience levels. Ms. Bourque-Moreau also puts emphasis on the French and French-Canadian repertoire which is widely used in the Canadian school curriculum. She has been a regular consultant to the Montreal School Board. She was also actively involved with Montreal's annual Children Festival ( La Fête des Enfants de Montréal ) as coordinator of the «Entrons dans la Danse» participatory workshop. France is the author of Je Danse Mon Enfance (I dance my chilhood) published in 1979 by FLDQ in Montreal and now in its fifth printing. The book contains some 80 dances as well as useful tips on teaching, with emphasis on rhythms, formations, cultural background and psycho-motricity. The book is also approved by the Quebec Board of Education. In 1983, she co-authored with Michel Landry La Danse d'Inspiration Traditionnelle au Primaire which suggests a pedagogical approach to teaching folk dance in elementary schools in relationship to holidays, rituals and trade guilds. It also looks at creative variations of traditional dances. Ms. Moreau is also active in the ORFF music education movement and was President of the Quebec Chapter of Orff Music for Children Canada and former secretary on the national executive. She has conducted lectures and courses across North America, Western Europe, Australia and Japan. For fifteen years she performed with the folk dance ensemble Les Gens de Mon Pays with whom she toured Europe and North America. She has also choreographed French-Canadian material for professional and amateur dance companies in Canada, the USA, the Netherlands and Australia. Her sessions with kids in Quebec elementary schools are elligible for funding through the Quebec Government program «La culture à l'école» (Artists in the schools) . Her widely-used CD «Danse, mon coeur danse!» featuring French-Canadian dances, rounds and songs for elementary and pre-school children has won much praise from educators throughout Canada. Madame Bourque-Moreau and her husband Yves Moreau, also a world-renowned folklore specialist, co-direct Bourque-Moreau Associés (BMA Productions), a consultation and production service in the field of multicultural folk arts. In February 2015, she was the recipient of the «Preserving Our Heritage Award» given by the National Folk Organization U.S.A. (NFO) for a lifetime of work and achievement in Folk Dance and Folk Arts.